Razer is the world's leading brand in high-end computer gaming peripherals. The eXactMat is Razer's first mousing surface, and it embodies the same attention to technology, design and ergonomics that has made Razer an industry leader in gaming peripherals. Two surfaces, "Speed" and "control" give you the options you need to give your gameplay a competitive edge. The large surface area provides plenty of room to make your best moves. A specially-designed, gel-filled wrist rest provides support for long gaming sessions. The non-slip, anti-reflective, abrasion-resistant Anodized Aluminum surface makes the eXactMat durable and long-lasting. It's got what you need to take perfect control of your gaming experience. I've owned a fUnc 1080, Ratpadz GS, and Thunder 8. The eXactMat blows them all away. This is the first pad I've owners which doesn't slide around at all. Really, it doesn't move. The bottom of the surface is totally rubber. You're not working with a few cheesy pads here. The surface itself is more dirt resistant than any other I've used. The aluminum frame makes for a solid piece. I've noticed no warping over time as I have with previous mouse pads. It also seems easier on my mice. I don't want a pad which will act like sandpaper on the bottom of the mouse. The size is appropriate. Not too big, not too small. It doesn't look tacky sitting on your desk, which is always a bonus. Who wants a mouse pad which looks like it's designed for 12 year olds? The wrist rest is great. It fits the pad perfectly and is comfortable. It's also a boon for your arm posture if you're a heavy PC user. The indent in the middle is a nice touch. The fabric cover is easy to keep clean and comfortable. I love this pad, durable, extremely accurate, and the wrist wrest is the most comfortable one i have ever had. size is just right, extremely comfortable, and responds wonderfully. If you are looking for a mouse pad, and you are a serious gamer...this is the one to get. If you are looking for a computer to game with: Ichtus Computers is the way to go. On the mousepad side of things, this double-sided mat is high quality all the way around. It has aluminum surfaces attached to each side of a thin, but sturdy aluminum plate. I use the speed side since it is smoother, with a Razer DeathAdder that I also recently purchased. Amazon was sold out of these-- the razer store has them. The pad is cool, despite the neon green decals, and offers a solid, large mousing surface. However, my Logitech Revolution Laser Mouse fails to track on the surface of this pad. This is a little odd considering I've played with this mouse and got it working on everything from glossy wood and transparent glass to a carpet on the floor. I purchased this as part of a combo, and it has just been phenomenal. I was using a Logitech Wireless Desktop MX Duo (MX700 mouse) on a plastic mat previously and was getting a little bored with the inherent lag of a wireless solution and the small size and feel of the mat. The pad is very well made, quite large (good for gamers using low sensitivity settings) and works like a charm on any mouse I've used on it so far (G5, Deathadder, MX512 and Copperhead). Both sides work well, but you may want to experiment with the type of mouse you have. I always preferred the Control side, but when I got my Deathadder I noticed that I liked it with the Speed side better. Don't think of it as Control giving you better tracking and Speed giving you better.. well... speed. It's more like what feels better to you with the type of mouse you are using, and with this pad you get 2 choices. With many other pads you're stuck with 1 surface. The wrist rest is a nice add on. I do not use it as I hate those things (make my wrist hurt actually), but for people that use em, this one will do the job. The first thing that happened after I bought this mouse pad is that it didn't work. I'd move my mouse on the pad and the cursor just wouldn't move. I took it back to the store and was surprised to find out that it worked there. So I took it back home, what else was there to do? It was only after a couple of hours of experimentation that I'd finally found out what went wrong. I have a cordless optical mouse. The receiver plugs in to the USB which is right next to my LAN slot. When the LAN cable is plugged in it seems to interfere with the signal from my mouse. But this is only the problem when I'm using this pad! If I'm not using it and just move the mouse over the surface of the table, or some other mouse pad, then there is no problem. But when using this pad, and the LAN cable is plugged in, then the cursor just won't move, or it moves but the movement is too jerky to control. However, that's not all! The edge of the pad is made of some sort of metal which gets really cold at room temperatures. If you use the pad then your wrist or the place just below your wrist will lean against the edge of the pad and at times it could be so cold it hurts (especially so if you sometimes like to open the window). So, if you value your hands and your money, be wary of this mouse pad. You'll probably be better off just using the surface of the table or using some ordinary, cheap, spongy mouse pad to protect the surface from friction damage. Overall, I'm happy with the pad. It has a nice textured surface that's enough for optical mice to pick up precise movements, yet still smooth to the touch. The wrist rest I love, it's so squishy and comfy, I'd really like to find one that's pillow-sized haha. My only real complaints, if you even want to call it that, is that I used the Ratpadz GS before this. That pad provided a bit more resistance to my mouse, which I grew used to and was comfortable with. This pad is much more slick than the Ratpadz GS, it feels like my mouse is sliding around instead of me pushing it around. Can be a plus or minus depending on personal preference, I suppose. My other complaint is the funky shape. It's like a warped out weird and funky square.. thing.. No idea. I would've been much more happy if it was a simple square, it would've sat on my desk much nicer. I usually push the edge of my pad along a squared off wall on my desk. I can't do that with this one or it'll be lopsided. Due to this, my keyboard sits on the corner of the pad. I just don't have enough room due to the funky shape. Again, not an issue for most, different sized desks and all, it's just what I'm used to and doesn't work as well for me. I just really think it would've been better off as a simple square. I also really like that it can be flipped over to the other side, so once this side gets worn down, I can simply flip it and use the other. Twice the life in one pad. Due to the less resistance and pressure against the pad itself, and the option to use both sides, I'm thinking this one will outlast my Ratpadz GS by quite a bit, and that one held up for around 4-5 years until I wore the surface down to a gloosy smooth surface which was unusable. I bought this together with a Razer Diamondback optical mouse. It works great for controlling high precision mice like Razer makes, however after about 6 months of average use the textured coating on the mouse pad wore off making the mousepad slick which defeats its purpose of using it for control. I've had this mouse pad for about a year now and I love it! I log a ~lot~ of hours on my computer playing games like BF2142, DAoC, Guild Wars, and others, and after a year of heavy abuse it shows zero signs of wear. The mousepad is like a dream for my Logitech G5 laser mouse, I'm certain I wouldn't get the amount of performance I do out of the mouse without a quality mousing surface. The mousepad has two sides, one for speed and one for control. The difference between the two is the texture of the surface. The control side boasts its friction so your mouse doesn't slide any farther than you want it too. The speed side has just enough of a texture for your laser or optical mouse to pick up a reading, but is smooth enough to allow your mouse to simply glide along the surface with zero resistance. When I first decided to upgrade from the cheap Allsop $3 mousepads, I went for some thing for comfort and tried a few mousepads with gel wrist rests attached. Then I wanted something with more of a performance feel, and something that looked good on my desk. I tried the Icemat and SteelPad, and finally came to the eXactMat and found the best of both worlds! I recently purchased this mouse pad and I really enjoy it. It does take up alot of room...more mouse space than I could ever use though. I believe the wrist rest is a bit high so it can sometimes be a little uncomfortable for me at my desk. But even though that may sound negative I don't regret the purchase in the least and I would recommend this mouse pad to anyone that is into gaming. I had this tiny Dell mouse pad at work, and it was becoming infuriating, constantly going off the sides with my mouse, so I popped onto amazon and bought one of these hoping it would stem my frustration. I was a little scared it was going to be too shiny for optical mice, but it works fantastic. The control side works excellent, and the slip side is *very* slippery if you're into that. I was skeptical about the hand rest, because I'd had gel ones before that just kind of put painful pressure on my arm, but the memory foam this comes with after about an hour or so of use comes to cradle your arm perfectly! I love it so much I bought two more for my home mac and pc. WARNING: No Razer mouse, you better test before you buy. I was looking at this mouse pad already at CompUSA where it was far higher prized but I wanted it. As soon as I came home I ordered in and waited at the door. As soon as I got it in my hand all kind of things started flying of my desk to make room for it, but well worth it! The first mouse I tested was a Microsoft laser mouse and it miserably failed! I could not get it to work at all (PANIC) but once I tested my Razer Copperhead everything work fine and (no surprise here) my Logitech Mouse also worked great! WARNING: In case you do not plan to use a Razer mouse you may want to test your mouse before you buy. Its wrist support and unique dual sided design works very well for me, one of the guys that sit thousands of hours a year in front of my computer. In addition I switched over to using my Razer Copperhead as my full time mouse for both gaming and my actual job writing code. Because of it size I never had to lift the mouse of the mouse pad, even while running dual 20" wide screen LCD monitors. Looking at its price it may be overkill for a thin, stamped-out sheet of aluminum with two different surface codlings, 8 rubber feel and a wrist rest. Looking at the price maybe, but I love it and would buy it again! Having used a variety of books for mouse pads to try and fully utilize my Razer Copperhead, the Razer eXactMat with the eXactRest is an incredible bundle. 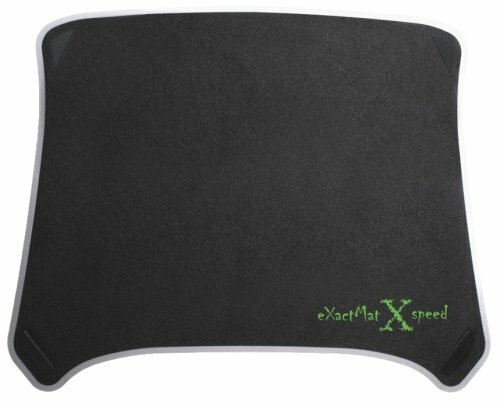 The eXactMat is the epitome of all mousepads, from it's aluminum construction to it's massive surface area and differently textured sides. The eXactRest is made just for the eXactMat, and it's contour-gel and slight dip in the middle for wrist placement is darn near perfect. Whereas I find my Copperhead mouse to be lacking in places, this mouse pad bundle is simply the best one may purchase. The only realistic problem that I foresee (given that the mouse pad can be bought alone) is the mouse pad being bent while taking it to wherever (presumably LANs). But that really revolves more around the follies of the user and less around this near-perfectly designed mouse pad.